am pleased to announce the “official” release of “Norman Granz Presents Jazz at the Philharmonic, Hamburg, Germany, February 29, 1956. As one of the parties who discovered this previously-unknown recording, I tried from day one to put it in the hands of a record company, so it could be released widely and properly. Sadly, no American company would touch it, and I was even told by the folks who now handle JATP material that this “wouldn’t sell.” This was hard to believe, in that it wasn’t too long ago that this same operation released a 1949 JATP discovery that featured Shelly Manne and Fats Navarro. I won’t mention names. Maybe I will. The company is Concord Jazz, now the owner of Fantasy, now the owner of JATP material. Shame on you. The good news is that the Fresh Sound record label out of Barcelona, Spain, took this project on and have given it the absolutely stellar, first-class release that it deserves. All the credit in the world must be accorded Fresh Sound founder Jordi Pujol and those associated with the release. Jordi is a man of taste and a man of integrity. His Fresh Sound label and its various imprints are simply spectacular. If it were not for him, an entire generation of young listeners would miss the chance to hear hundreds of jazz legends. And veteran fans are now able to rediscover their favorites. For those who may have forgotten, this concert featured a scaled-down but quite swinging JATP crew, including Dizzy Gillespie, Roy Eldridge, Illinois Jacquet, Flip Phillips, Oscar Peterson, Herb Ellis, Ray Brown, Ella Fitzgerald, and playing the entire concert on drums, none other than Gene Krupa. Fresh Sound has not only digitally remastered the music, but has included two gorgeous and informative booklets. One was written by yours truly and other is the actual program–in German–from this concert. The deluxe, two-CD set is extraordinary in every way. It is available all over the web, from places like EJazzLines.com, Worlds Records.com, and many more. I do urge you to go to the www.FreshSoundRecords.com site, if only to check out their hundreds of other great CDs. Bopworks’ Chris Bennett and I are poised to begin production on the “officially sanctioned” Gene Krupa drumstick. We are just waiting for the official go-ahead by the Krupa Estate. The stick itself, as previously mentioned herein, is an exact duplicate of the 1948 Slingerland model. Each pair will have a replica of Gene’s actual signature. 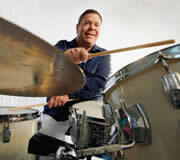 Very, very instrumental in helping to bring all the parties together is drum great and bandleader Mike Berkowitz. Michael, from day one, has been generous with his time and with his knowledge. This could not have happened without him. We are happy to be carrying Michael Berkowitz and the New Gene Krupa Orchestra’s initial CD. We hope and trust that we will have the honor of carrying his forthcoming release. I’ve heard a lot of Krupa tribute bands, including my own, going back to the days of–does anyone remember?–Brent Brace. Michael’s is the best of all. And by the way, Michael Berkowitz will be the first, official “endorsee” of the Gene Krupa model stick (until I try them first). There is a new drum magazine in the marketplace, and it’s a darn good one. “Traps,” subtitled “The Art of Drumming,” comes from the good offices of Enter Music Publishing of San Jose, CA, edited by industry veteran Andy Doerschuk. Currently a quarterly, “Traps” is an exquisitely designed and produced publication that is heavily geared in favor of jazz. Indeed, their latest–and second issue–is devoted to Jeff “Tain” Watts,” who is given almost book treatment. Other pieces concentrate on the drummers of Blue Note records, the Motown giants. equipment reviews (including Bopworks drumsticks), and an analysis of the drumming of the one and only Mitch Mitchell. With your loyal interest and support, “Traps” will hopefully go monthly. They deserve to. Their stellar stable of writers includes giants like Chip Stern, Bill Milkowski and Bobby Sanabria. I think I’ll give them a call and see if they need another writer. For subscription information, log onto TrapsMagazine.com. I wouldn’t steer you wrong. Many of our good international visitors are aware that I am in Naples, Florida, the southwestern portion of the state. My most significant other, the great jazz singer and photographer Joy Adams, has just undergone hip replacement surgery here. Joy is directly and indirectly responsible for JazzLegends.com It wasn’t too long ago that I wouldn’t have anything to do with computers. Joy bought me my first one in 1996, and here we are. She is doing very well in rehabilitation and will hopefully be home here in Naples as you read this. I know Joy would love to hear your good wishes via email, so open up your hearts and contact Joy at: DrumAlive@aol.com. Better yet, consider obtaining her superb CD, “Joy Adams Sings the Classics,” listed on the CD page of the JazzLegends.com web site. We somehow knew that Maynard Ferguson’s appearance last month at the Philadelphia jazz club, Zanzibar Blue, would represent the last time we would see and hear this giant. Sadly, we didn’t make it there, and word has now come that Maynard Ferguson has passed away at the age of 78 of kidney and liver failure resulting from an abdominal infection. He was the last one. The last of a breed. The last, big-band bus road warrior, constantly traveling the highways to perform at high schools, colleges, clinics, clubs and jazz festivals. The big band era, such as it was, is now officially over. Maynard was among the very, very few who played this music called jazz who managed to appeal to those who may not have liked jazz before or since. The list, which will not include artists of the Kenny G. era, is a short one, and includes Krupa, Rich, Ramsey Lewis, Brubeck, Cannonball, Eddie Harris, Kenton and Goodman. In many cases, jazz critics past and present never forgave many of these artists for having hit records or for having appeal beyond three record reviewers who sit in a dark room. For the past several years, he has been virtually ignored by the polls, and the jazz and music press, despite his substantial contributions to jazz education and that he was the last big band leader to be on the road regularly. Also not acknowledged was the fact that Ferguson’s bands through the years served as an undergraduate university and training ground for dozens of future jazz stars. This list, starting from the old days, includes players like Willie Maiden, Slide Hampton, Jimmy Ford, Lanny Morgan, Rufus Jones, Don Sebesky, Joe Zawinul, Jaki Byard, Don Menza, Frankie Dunlop, Carmen Leggio, Bill Watrous, Chick Corea (who subbed for Jaki Byard at Birdland! ), Mike Abene, Ronnie McClure, Peter Erskine, Greg Bisonnette, Dennis DiBlasio and countless others. I was lucky enough to see the famed late 1950s/early 1960s band at Philadelphia’s Academy of Music in 1961. 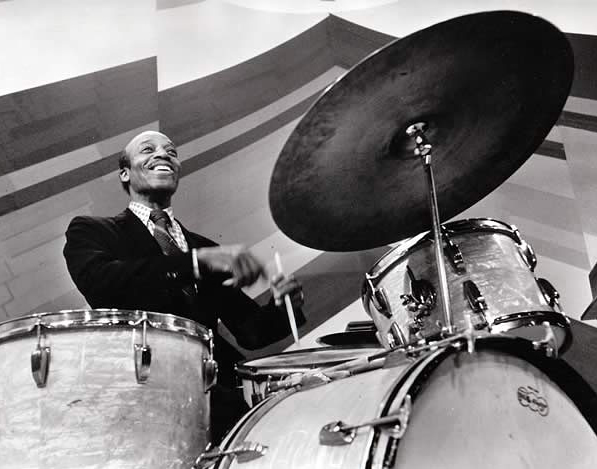 I learned to play drums by playing along to “At the Sound of the Trumpet” and “Frame For the Blues,” two Maynard tunes regularly played by Philadelphia radio personality and Ferguson booster Sid Mark. I saw the English band, the rock bands, and the bop band. Maynard was always moving, always inspiring, always the focal point of whatever was going on, no matter what musical style was being played. His playing, particularly his high note leads, made me feel as if I were on a roller-coaster, going down the first hill. I’m told he still had “it,” even at the age of 78. He was. And for much more than a day. In another recent and probable passing, this one corporate, word has come that Tower Records has declared bankruptcy. This comes as no surprise to those of us who have visited Tower in recent months and saw the chain’s once mighty stock dwindle and dwindle to no more than that of a rack jobbers’ at K-Mart. At its height, Tower had a superb selection of domestic and imported jazz CDs, a wonderful magazine section, and a great stock of jazz-oriented videos and DVDs. Certainly, most buying has moved online these days, but there was just something about having the chance to peruse, to relax, to browse through the selections, and to perhaps read some of the linear notes, that is missing from the online experience. However, no retailer could compete, in terms of stock, with an online retailer. It is indeed possible, sad to say, that the days of “record stores” of any size may be numbered. Potential buyers who haven’t visited great, great sites like Ejazzlines.com, Worldsrecords.com and even, in a pinch, Amazon.com, will be very pleasantly surprised at what they have to offer and their superb service. As the newsreel said, “Time…marches on.” But why didn’t they ask me first?